Can I Dye Hair Weaving Extensions? "Can I dye hair weaving extensions?" 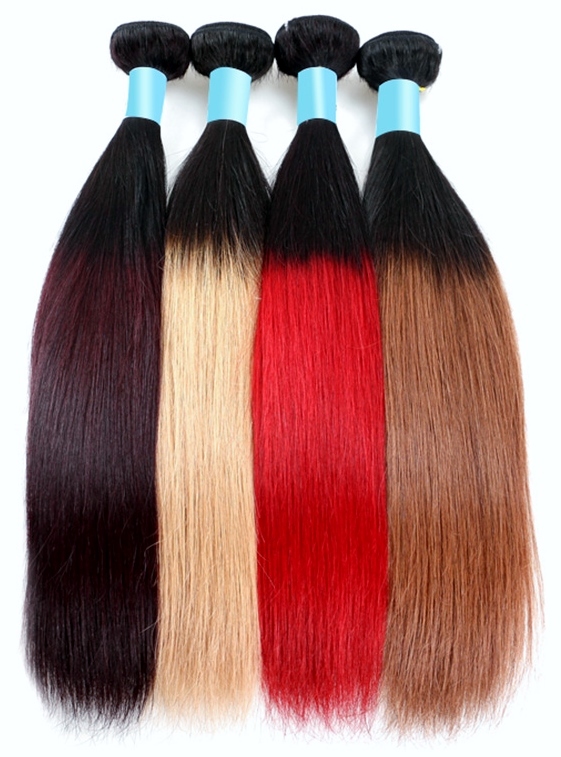 Human hair weaving extensions can be dyed but whether or not they should be is a different question. In most cases, the weft hair extensions have already been dyed so repeated dyeing can damage the cuticles to the point that the hair becomes very brittle, dry and prone to tangling. If you want to dye your weave hair then check the packaging to find out about the history of the hair and choose weave extensions that have not already been processed for colour. This isn't to say that you can't dye hair weaves more than once, just that you stand a better chance of not ending up with damaged hair if the hair is not repeatedly dyed. As with all hair dyeing, the results are always more predictable when you go from light to dark instead of dark to light. If you do decided to go lighter, be aware that you may have to lift the current colour before dyeing again to reach your hair colour goal; and if you have multi-tonal weave hair extensions, the dye will not produce a single solid colour. It's important to nourish weft hair extensions after they've been dyed. They can be lightly misted with a leave-in conditioner to help strengthen the hair after exposure to the dye. As protein conditioners can dehydrate hair, it's important to apply a hair oil or moisturizer to the hair whilst it's still damp. "Can I chemically perm or straighten hair weaving extensions?" If the weft hair is completely unprocessed, it can be chemically permed or straightened; but if it's already been chemically processed for texture (straight texture weft hair extensions, wavy textured weft hair extensions and curly texture weft hair extensions) then ideally it shouldn't undergo that process a second time. Chemically processing hair for texture automatically alters the structure of the hair and further processing weakens the hair. This isn't to say that it can't be done, just that in order to preserve the lifespan of the weft hair extensions, it's better that they are not exposed to further chemical processing. Since we're on the subject of chemicals, weave hair should always be washed after exposure to sea water and chlorine from swimming pools. "Can I heat style hair weaving extensions?" How you would use heat on your growth hair? Infrequently and on a low setting... Right...? Right. You can use hair dryers, heated rollers, irons, tongs, wands and crimpers on your human hair weave extensions, but the key to limiting any damage to the hair is to use those heat styling tools infrequently and at the lowest possible settings. As wavy or curly weave hair extensions have usually been processed for texture, overusing heat styling tools can permanently distort or damage the texture. The same can be said for straight textures including silky straight as well as the relaxed (yaki) textures. It's not uncommon for silky straight textures to be achieved through chemically straightening hair that is basically straight but has natural light waves and on this theme, there's an article that answers the perennial question: why does my straight human hair wig become wavy when wet? When straight weave hair textures are frequently heat straightened the hair can become permanently brittle which leave it prone to being frizzy and tangling. The use of heat protection serums and sprays on your weft hair extensions can help to reduce the impact of heat styling tools. Okidoki Karaoke; dyeing and styling hair weaving extensions done! If you want to keep up to date with the next guide about hair extensions, wigs and hair pieces then join our blog, check the Hair Extensions Q&A section or use the navigation menu.